Thanks for checking in. Here are our current specials and hot offers that we hope you’re able to take advantage of when holidaying in sunny Mildura. If your Club or Group (Caravan Club, Motoring Groups etc) book and stay for 3 nights, we’ll give you another night for FREE as well as a FREE BBQ pack and drinks! This offer is available on Ensuite Sites, Powered Sites and in Cabin accommodation. 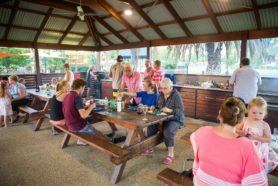 Your group is also welcome to use our large BBQ Gazebo that has plenty of seating. Just remember to bring your sense of humour as we’re sure you’ll have a fun time getting together with your crew here. Come on, you know it’ll be great! Take a look at all the local attractions you can visit too. Call us on 1800 22 33 75 to book and find out more. 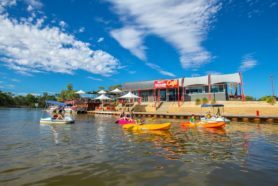 Upon arrival at All Seasons Holiday Park, you’ll receive discounted offers, including a free coffee voucher at the nearby Dockside Cafe – a great place for breakfast and lunch with a superb view at the Mildura Marina. 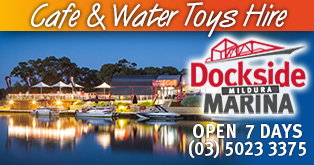 Also included are discounts for the fun water activities at Dockside Watersports. Remember, no license or experience is required for a great time on the river! If you’re a G’DAY Rewards member of Discovery Parks or Top Parks, you’re entitled to 10% off up to $50 per stay. Find out more here. Remember to keep an eye on our Facebook and Instagram pages, as sometimes we have super specials there.